Red Dragon Inn 2 adds four new characters, and a lot more game play interaction! Let’s go in and see who waiting inside! Red Dragon Inn 2 is a stand-alone expansion to its predecessor. So you don’t have to have the original set to play. It comes complete. That said, we wont go through the rules again here as most if not all of them are the same. 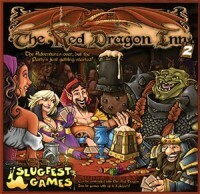 If you want to see how the game is played, check out out the Red Dragon Inn review here! He’s garish. He’s talented, and he loves to gamble. Fleck has a lot of flair and like most Bards can inspire and affect all the players at the table when he plays his lute and recites his tales of glory! And like most performers he charges for his talents. Yes, Fleck likes his gold and loves to gamble with it. Fleck’s deck (heh heh) has a lot of gambling, cheating and Sometimes cards that allow him to affect Gambling. So best watch him closely when it comes to games of chance. He is not much risk to other players’ fortitude. Most of the time he just wants everyone to join in and have a wonderful time at the Inn. This means more gold for him more drinks for everyone else! Each other player loses a Fortitude (from rowdy dancing?) and everyone gains 1 Alcohol content. Fleck must pay 1 Gold for the broken furniture, but its worth it! She’s beautiful… or is she? Being an illusionist certainly has its good points! Eve is very good at making others believe what she wants which includes slight of hand and illusion. Most of her deck allows her to ignore and negate effects. Annoying… I know. And every now and then her illusions can cause real losses of fortitude. But her deck is no illusion. A very difficult deck to beat since she always seems to be able to counter whatever may come her way. Eve isn’t all deflection; she can dish it out too. I mean illusions can hurt. Simple, but effective. Use this card to ignore and action, sometimes or anytime card that affects Fortitude, Alcohol content or gold. Basically ignore anything. It’s just an illusion! Dwarves can really hold their drinks and Dimli is no exception. He an expert at ignoring the effects of drinks, and making others drink as well. He can even add potency to the drink you’re drinking – just by adding a little firewater! One quarter of his deck is all about drink effects. Dwarves are also quite… um… ill tempered at times. Some might even say grumpy? This is reflected in many cards that deal out losses to other player’s fortitude. Dimli also has a few ways to find his way out, or back into a round of gambling. When another player drinks from their Drink me pile, that player drinks an additional drink. This can knock a player right out of the game, especially if paired with “Spike it with firewater” adding 2 to the alcohol content of a drink being drunk. Youch! Me like Gog. Gog good deck. Gog have lots of good cards but mostly Gog strong. Big and strong. So strong sometimes Gog accidentally hurt other players. Gog gamble and drink ok, and sometimes so strong ignore bad things. But mostly Gog hurt you. Yes …Gog good. Another player lose 4 Fortitude. That a lot, Gog think. Big ouchy. Aside from the Inn’s normal fare, the wench may bring a few new drinks to your table. Dwarven Firewater: Straightforward – like a dwarf. Gain 4 Alcohol content. Mead: Gain 3 Alcohol but may be split with another player taking half the Mead’s effect rounding up! Dwarves like Mead. I hope Dimli doesn’t notice! The Challenge! This new Drink Event challenges you to draw two drinks and drink them, if they don’t knock you out, you get one Gold from each player. Red Dragon Inn 2 adds new artists to the mix: in addition to Kennon James and Beth Trott, Rhonda Libbey, Doug Kovacs and Rose Besch create whimsical characters to make the game play connect with each character’s unique class and race. The quality of the components is about the same as the original product. But again – so much work went into the art, and fun card design, that it just doesn’t matter. If it does, then this isn’t the game for you. With Red Dragon Inn 2 you have a bit more theme added to the character decks. The big goofy half-ogre causes fortitude damage. The dwarf can affect drink cards to his favor and so forth. In the previous game you had a very balanced deck with many similar effects. This time, choosing a character to play definitely gives away a bit of that player’s strategy, if that player plays to the deck’s strength. But with this game, half the fun is flipping that Drink card on your Drink me Pile and finding what happens. And so your strategy may be well planned, but … you never know how things turn out in the Red Dragon Inn. Combined with the original game there are some great character matchups, Zot and Dimli make interesting adversaries. Fiona and Gog can just get plain ugly. Eve and Dierdre practice the art of diversion and misdirection quite well and the gambling practices of Gerki and Fleck can be downright annoying. But now besides expanding the game to 2-8 players, the combinations of deck interactions makes the game that much more fun. If you enjoy Red Dragon Inn, this standalone is a must have! The Red Dragon Inn 2 introduces four new members of the party. The Red Dragon Inn 2 may be played alone or in combination with other versions of The Red Dragon Inn to allow games of up to 12 players! What more do I need to say other than drinking and gambling…….LOVE the theme on this game, the art is pretty good, and the whole concept of getting so drunk that you’ll be tossed out of the tavern is too funny!! And also, what other game can you use the word ‘wench’, haha. Love playing this game, the instructions are easy to learn, the game is easy to play, and everyone has loads of fun playing it!! Definitely recommend playing this game. This game, it’s better with more people. When we have boardgame nights, people WANT to play this game but some had to sit out until now. Max player size in 1 game from 4 to 8. All new great personalities, characters and flavor I love it. Also a stand-alone if you don’t like the old characters. Produced very well. Fun every time I play it. Tip: Role play the characters a bit, it makes it ten times better. Eve, my favorite, good at avoiding & deflecting, but not so good for endgame & she always seems to come in 2nd. Great balance of play, good party game & does NOT require you to be a D&Der or a Drinker or a Gambler. I did not think I would like it, after playing I said “I have to own that game” for the 1st time ever. Played with my parents, they did not think they would like it, now it is a family favorite for family get-togethers. I have never actually gone into a bar and drunken myself into a stupor, yet despite the questionable theme, it is my favorite game. Each player is a different character in a Dungeons and Dragons-style fantasy setting. The quest is over and now everybody is drinking, brawling, and gambling at the Inn. With all the current expansions, you can play up to twenty people! (In larger games, gambling is much more powerful btw.) Great fun to play as a nightcap for an evening of gaming. Add a Review for "The Red Dragon Inn 2"